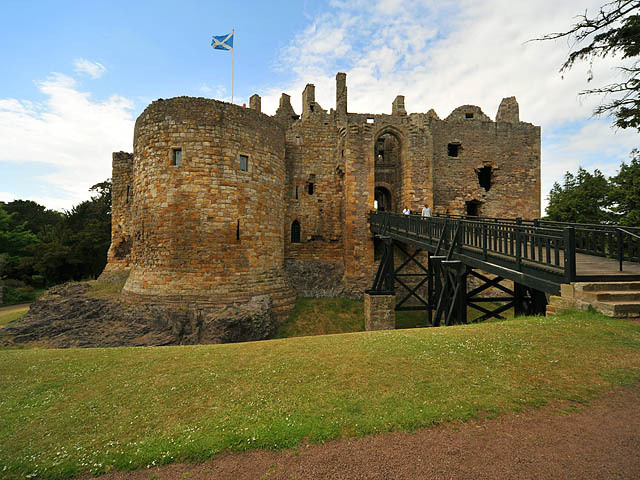 Dirleton Castle is one of the Scottish castles that has a long history with only a short history connected with the Maxwell family. The lands of Dirleton were acquired by the de Vaux family in the early twelfth century. They were wealthy Anglo-Normans who came to Scotland during the reign of David I (1124-1153). The date for the construction of Dirleton Castle is unknown, but as early as 1297, when Edward I of England invaded Scotland, it was known to be a very strong fortification. In July 1298 Dirleton was besieged by Anthony beck, the martial Bishop of Durham. After a long siege the castle surrendered and was for a number of years an English stronghold. It was only after the Scottish defeat of Edward II at Bannockburn that the castle returned to Scottish control. During the reign of David II (1329-1371), the de Vaux male line ended and the Dirleton passed to Sir John Haliburton by marriage to one of the de Vaux daughters in 1340. In 1440, Sir Walter Haliburton, Lord High Treasurer of Scotland, was created Lord Dirleton. In the early 1500s, the Haliburton male line ended and about 1515, Jonet, the eldest daughter of Patrick, Lord Haliburton, married William, second Lord Ruthven, and one third of the barony of Dirleton and its castle passed into the Ruthven family. The Castle remained in the Ruthven family until the early 1600s, but because of their participation in the Gawrie Conspiracy, the estate was forfeited and given to Sir Thomas Erskine of Gogar. Sir Thomas acquired the other two-thirds of the barony from descendants of the Haliburton co-heiress and restored the barony to its original extent. In 1625, Alexander, son of Sir Thomas Erskine, sold the lands of Dirleton to Sir James Douglas, who in turn sold them to Alexander Morieson of Prestongrange. In 1631, the lands of Dirleton were purchased by James Maxwell who had the previous year acquired the lands of Innerwick, southeast of Dunbar. In 1646, Maxwell was created Earl of Dirleton, Lord Fenton of Eibotle. He was succeeded by his daughter who married an Englishman, Viscount Cranborn. Her son, James, sold Dirleton to Sir John Nisbet in 1663 and, on the death of his grandfather in 1668, became Lord Salisbury. Representatives of the Nesbits still own Dirleton, but since 1924, it has been in the care of the Secretary of State for Scotland and is now maintained on his behalf by Historic Scotland. During the Civil War, Dirleton was occupied by Scottish Royalist horsemen known as moss-troopers. They attacked the lines of communication of Cromwells army, capturing men, munitions and provisions. In 1650, the Castle was besieged by 1600 troops under the command of Monk and Lambert. When the castle fell, the commandant Waite and two officers were executed and the English demolished the castle. It was never rebuilt. This chapter in the history of Dirleton Castle occurred during the time the castle was owned by the Maxwell family. Dirleton was built on a large rock outcropping that provided a firm foundation and protected the castle from mining operations. Around the castle was a deep moat about fifty feet wide. All that remains of the original castle is a square tower and two round towers on the southwest side. Over the years, the owners rebuilt much of the entrance on the south side and added the great hall range on the east side. A massive new gatehouse was built next to the massive tower of the original castle. The gatehouse was protected by a movable wooden bridge which rested on four piers and spanned part of the moat. A drawbridge which spanned the last section of the moat was operated from a superstructure carried on an arch between massive buttresses projecting out from each side of the entrance passage. On the east side there is a very thick outer wall, part of the basement which was hollowed out of solid rock. The basement houses the bakery with ovens, a well, and several large vaulted cellars. Above the bakery is the vaulted kitchen with roof ventilation, two large fireplaces and a service room leading to the great banquet hall. The banquet hall is 75 feet long and 25 feet wide. It was probably during the Ruthven period that the formal terraced garden to the west of the Castle was laid out, planted with holly and yew. Northeast of the Castle is a fine example of a dovecot, furnished inside with hundreds of stone nesting boxes, and it also dates from the Ruthven period. Dovecots were used to provide fresh meat to the castle during the winter.